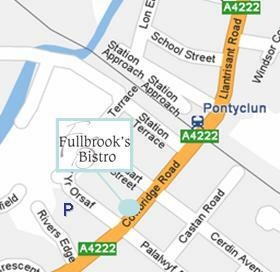 Fullbrooks Bistro, good food with an excellent ambience. 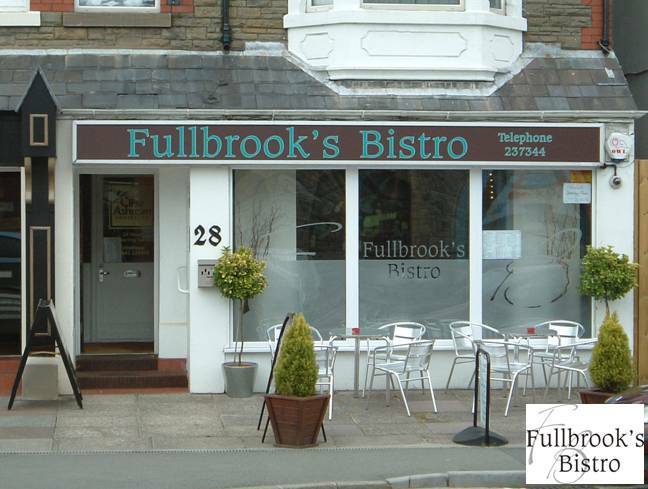 Fullbrook's Bistro - Our family run Bistro Restaurant is located in the busy village of Pontyclun, convenient for shopping at the local butchers, gift shops and grocery stores. We are only 5 minutes drive from Talbot Green Retail Park! We are really pleased to see all the new development and the additional businesses joining our little street. We really are getting to be the 'Little Cowbridge' of RCT! Fullbrook's Thanks - Helping cut the cost of eating out in style. Why stay at home when you can make your main meal of the day something special for less! We are located on the main Pontyclun high street, by the Zebra crossing. If you don't want to drive we are a '2-minute' walk from the train station. Reservations are always recommended so please call us on 01443 237344. You can email us on goodfood@fullbrooksbistro.com if you have any questions about our Private Dinning, Business Lunches or Christmas menus. LUNCHTIMES: We are open from Tuesday - Sunday 11.30am - 3.00pm. It is a work in progress, so if there is anything you would particularly like to see us add please let us know, our email address is marketing@fullbrooksbistro.com.